The field of optogenetics integrates optics and genetic engineering to measure and manipulate cells (frequently neurons) and their governing biomolecular processes. The tools and technologies developed for optogenetics research utilize light to detect, measure, and control molecular signals and cells in order to understand their functions. Example schematic of an optogenetics procedure. A channelrhodopsin, fused to mCherry, is expressed in neurons (red dots). When exposed to light of the correct wavelength, the pore opens, cations flow into the cell (yellow dots), and the neuron is activated. In this overview, we will focus on the common actuators used in optogenetics. For information on sensors, check out our biosensors collection. Opsins are light-gated ion channels or pumps that absorb light at a specific wavelengths. Upon activation by light, these channels and pumps respond by opening or closing, which conducts the flow of ions into or out of the cell. Scientists have identified a variety of naturally occurring microbial opsins that respond to different wavelengths of light, like blue or yellow light. These various opsins also initiate different electrochemical responses, such as nonspecific cation influx vs. proton efflux. Researchers have used genetic engineering to improve these natural opsins - by inducing point mutations to alter the absorption spectrum or adding trafficking signals to localize opsins to the cell membrane. Microbial opsins, such as those described below, can be targeted and expressed in specific subsets of neurons, allowing precise spatiotemporal control of these neurons by turning on and off the light source. Optogenetics has been broadly applied to study the physiology of the brain and nervous system to better map and understand neuronal circuits. Optogenetic tools have also been used to trigger and study certain behavioral responses in model organisms like mice, zebrafish, and Drosophila. These tools have been instrumental in neurological disorder research, helping scientists to better understand Parkinson’s disease, depression, drug addiction, and more. Below is a list of commonly used microbial opsins, including a brief overview of the wild-type opsin of each and some examples of relevant variants. This list is not exhaustive - please browse our curated list of opsins here to find the right optogenetics plasmids for your experiments. Channelrhodopsins are a foundational optogenetics tool - they typically allow the fast depolarization of neurons upon exposure to light through direct stimulation of ion channels. Naturally occurring channelrhodopsins were discovered in the green algae Chlamydomonas reinhardtii. 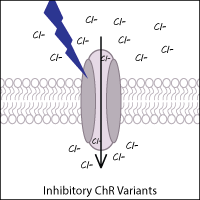 Channelrhodopsin-1 (ChR1) is excited by blue light and permits nonspecific cation influx into the cell when stimulated. Channelrhodopsin-2 (ChR2), the first widely adopted optogenetic tool, is also a blue light activated cation channel. ChR2 is preferred over ChR1 because ChR2 has higher conductance at physiological pH and trafficks well to the membrane. Halorhodopsins are light-gated inward chloride pumps isolated from halobacteria. 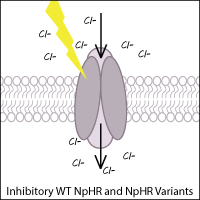 Wild-type halorhodopsin, known as NpHR (from Natronomonas pharaoni), causes hyperpolarization (inhibition) of the cell when triggered with yellow light, thus inhibiting function of the neuron. Archaerhodopsin-3 (Arch) from Halorubrum sodomense is also commonly used to inhibit neurons in optogenetic experiments. Arch is a light-activated outward proton pump that hyperpolarizes (inhibits) the cell when triggered by green-yellow light. Leptosphaeria rhodopsin (Mac) is a blue-green light-activated proton pump derived from the fungus Leptosphaeria maculans. 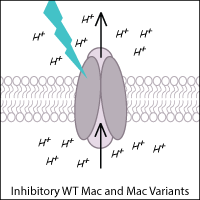 Mac and its variants allow for inhibition of neurons using blue-green light. Optogenetic excitation or optogenetic inhibition. First things first: do you want to turn ON or turn OFF neurons in your experiment? Depending on your answer, you’d pick an excitatory or inhibitory opsin, respectively. Color of activation light. There are a variety of different activation wavelengths, ranging from blue to yellow to red. Red light exhibits better tissue penetrance, which may allow you to place the optic fiber outside of the brain, rendering the experimental procedure less invasive. Different activation wavelengths also make it possible to combine multiple opsins in the same experiment. For example, you could use different colors of light to activate/silence the same neuronal population, or activate different neural populations at distinct times. Temporal considerations. Temporal precision is key in optogenetic experiments. Your experimental design will determine whether you’ll need short or long periods of neuronal activation/inactivation periods. These can range from msec (hChR2) to “long lasting,” e.g. seconds to minutes with stable step-function opsins (SSFOs). Opsin delivery systems. Two factors determine which neuronal population is manipulated in a given experiment: the expression of the opsin and the area that is being illuminated. There are several different ways to control opsin expression. Generally, the most robust and stable expression is achieved in a transgenic mouse line, such as for example the VGAT-ChR2 mouse, where ChR2 is expressed under the control of the vesicular gamma aminobutyric acid (GABA) transporter (VGAT) and ChR2 is thus expressed in all GABAergic neurons. In this case, the subpopulation of GABAergic neurons being activated by the light is controlled via the placement of the optic fiber. Using viral vectors for opsin delivery results in more localized expression of the opsin. Depending on the virus and promoter system used, there is an incubation time (days to weeks) until peak expression of the opsin is reached. This approach is especially powerful when combined with site specific recombinase technology like Cre-lox, which allows you to express an opsin ONLY in a genetically defined subpopulation of cells within the injection site of the viral vector, rather than in all cells. For example, using a viral vector with a floxed opsin in a VGAT-cre animal will result in expression of the opsin only in inhibitory neurons near the injection site. Researchers have harnessed plant and bacterial photoreceptors to create protein systems controlled by light. These “photoswitchable” proteins offer exquisite spatial and temporal control of protein activity. Phytochrome, cryptochome, and LOV (light oxygen voltage)-based systems have been used in many experimental contexts, including protein activation, membrane localization, and transcriptional activation. 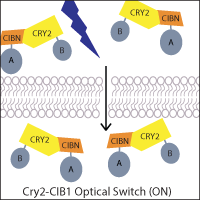 In the widely used Cry2-CIB1 system, light induces a conformational change in cryptochrome Cry2 to permit CIB1 binding. 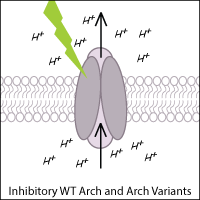 As shown in the figure above, this light induced binding can be utilized to control the localization of a protein of interest. A genetically-encoded nuclear Cry2 fusion can thus direct a CIB1-protein fusion to the nucleus upon light activiation. Alternatively, when one half of a given protein, such as the Cre recombinase, is fused to Cry2 and the other half to CIB1, light-stimulated heterodimerization can reconstitute the protein. 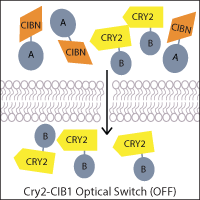 This principle has also permitted the design of synthetic two-part transcription factors - Cry2 and CIB1 are fused to a transcriptional activation domain and DNA binding domain, allowing light to activate transcription. Phytochromes and light oxygen voltage (LOV) domains function similarly to cryptochromes with light-induced changes in protein conformation/dimerization. In addition to the applications described above, both LOV and Dronpa can control activity of a fused protein through allosteric interactions. Researchers continue to engineer new optobiology tools and improve upon previous tools through directed mutagenesis - use Addgene's Optical Switch Plasmid Table to search for plasmids for your next experiment. For a full description of different domains used in these plasmids, see the Glossary below. LARIAT Inhibits protein function by reversibly sequestering targets into large, optically assembled protein architectures in living mammalian cells. 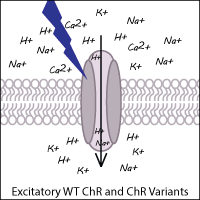 Lumitoxin Peptide toxin for blocking K + (Kv) channels fused to LOV2 photoswitch. Illumination causes the photoswitch to unfold, lowering the toxin's local concentration near the cell surface, and enabling the ion channel to function. TULIPs Tunable light-inducible dimerization tags (TULIPs), plasmids allow cloning of protein coding sequences with GFP-LOVpep, cpPDZ, ePDZb and ePDZb1 as tags.